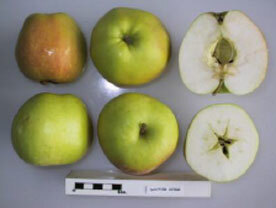 The Doctor Hogg apple was grown by Head Gardener Mr S. Ford of Leonardslee, near Horsham and thought to be a seedling from the variety Calville Blanc. It was introduced about 1880 by W. Paul & Son, Herts and awarded an RHS First Class Certificate in 1878. It is currently cultivated as part of Brighton Permaculture Trust’s National Collection in Stanmer Park, Brighton. You can see a Doctor Hogg apple tree (planted 2011) in Home Farm Orchard, Stanmer Park ( map). A very large apple, conic and ribbed on body of the fruit. The skin is yellow, flushed pale red with slight stripes and russet patches. White flesh, sweet with slight acidity. The fruit can be picked in early September and stored until October. Doctor Hogg is a vigorous, upright growing tree.